The Lust Garden Book Tour: Enter to Win a $50 Amazon Gift Card and Autographed Books! With her perfectly tousled blonde hair and pink, pouty lips, Gianna Salvani is the girl everyone loves to hate. She has it all -- fame, fortune and unrivaled beauty. But behind the seductive smile is an insecure girl who still grieves for the father she lost years ago. With a controversial new film in the can and the release of her debut album looming, Gianna is poised to take center stage. But when a shocking secret leaves her exposed, her fame will bring her face-to-face with a nightmare she never saw coming. Lurking in the shadow of her spotlight is an obsessed killer with plans of his own for Gianna. Ignited by his first conquest, Gianna’s greatest admirer begins a brutal hunt to claim her as the ultimate trophy in a string of look-alike murders. Motivated by envy, he forces himself into her seemingly untainted world and threatens to ruin everything she’s built by revealing a hidden tie that binds them. And if you knew his secret, you’d want to kill her, too. Promotional Book Tours and Billy Jolie are giving away a $50 Amazon Gift Card and 5 autographed copies! To enter, simply fill out the easy Rafflecopter form below. Attacked by a wolf while hiking in the mountains, Anna Avery’s life just got a little hairier. Living in the Big Horn mountains in Wyoming, with a group of werewolves who are more animal than human, Anna must try to hold onto her human side. It’s not easy when the alpha continues to persuade her into his bed, while another wolf is chomping at the bit to become her mate. To top it all off, dead bodies are showing up, and it just so happens that Anna was the last to see them alive. She’ll have to work to prove her innocence and taming the wolf who bites first and asks questions never. 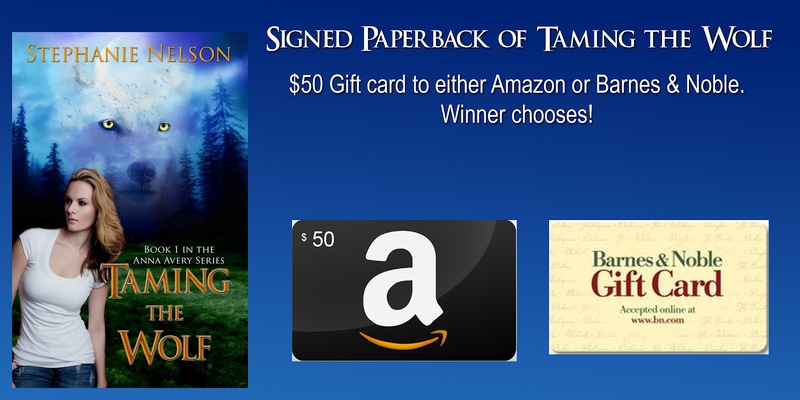 One lucky reader will win a $50 gift card to Amazon OR Barnes & Noble (winner’s choice) and a signed paperback copy of Taming the Wolf! Just fill out the form below. Young children can learn so much from reading their favorite books with a loved one. They learn by listening and participating in a way that actively encourages their imagination. If a child sees reading as a fun activity from the start, he will usually enjoy reading as he gets older. The use of simple poetry can bring a story alive in a way that an “only prose” story cannot. A repetitive poetic refrain can captivate. A child will often take “ownership” of a short verse and want to be the one who “reads” it. The clever use of fonts (different size letters, color and shape) also can enhance a child’s enjoyment of the story (with a request for a re-read the next storytime or bedtime). Anything from making flashcards to acting out the new words can be fun ways for children to learn and remember the new vocabulary. Searching for synonyms and antonyms in the poem can be turned into a fun scavenger hunt. For example, draw attention to an unusual or new word and talk about words with similar or opposite meanings. See how many words the child can find that she doesn’t know and do the same thing. It can be fun to search for nouns, adjectives, and verbs in the child’s favorite poems as well. In my newest children’s book, The Labyrinth, I incorporate a small verse that is repeated five times at key points in the story. This delights children. For young children, the rhyming and natural rhythm draws them into a story. Adults get caught up in the fun of it as well. Who doesn’t still remember, “red fish, blue fish, one fish, two fish,” or “a person’s a person no matter how small”? Seuss and many other wonderful authors offer children so much. So, join in the fun and find books to read that include poetry and rhymes. Thomas Weck is the creator and co-author -- with his son Peter -- of the Lima Bear Stories. Originally made-up bedtime stories he told his four children, the Lima Bear tales resurfaced when Weck’s son Peter had children. Peter remembered the stories and wanted to have his father write them down so that he could share them with his children. Father and son took it one step further and created Lima Bear Press to produce the stories as books that children everywhere can enjoy. The first three titles in this award-winning series were released in 2011: The Megasaurus, How Back-Back Got His Name, and The Cave Monster. The Labyrinth will be released in August 2012. The books are not only fun and funny, with great illustrations, but they also have an underlying message such as tolerance, honesty, courage, forgiveness, etc. Additionally, each book has an extended Learning and Activity section at the end where children can become active participants in the story experience. Learn more at LimaBearPress.com.